Lake Sarykamysh– is closed, salt lake in the central part of Sarakamysh hollow in Turkmenistan. The square of the lake is nearly 5000 square kilometre, length is 125 km and width is 90 km. The depth of the river is 40 metre. In summer the temperature of the water is 27-30 degrees. The shores of the river are sandy and rugged. The west and south part of the river are shallow. There is thermal mineral source on the east shore. The north part of the river is on the territory of Uzbekistan, approximately between the Caspian and Aral seas. Hollow of Sarakamysh Lake is attached to the delta of Amudarya. The water in lake is pure and transparent. Fishing is very well developed here. Kelif Lakes were formed in 1950 by filling water of Karakum Channel. The total area of lakes is 85 square kilometre. There are more than ten thousands of birds here. There are also a lot of fishes in the lake and reed thickets on the shore, therefore Kelif reserve was created here. 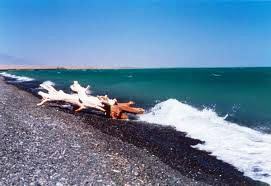 Garashor is a very big lake (27,5 square kilometre) which means “Black salt”. It is located on the border of oazis and dessert. The lake is rich by fish. If you are in Turkmenistan, visit one of these beautiful lakes.